Professor Katherine Brown, associate professor of communication and faculty director of the Career Readiness Initiative in the College of Humanities, Arts, Behavior and Social Sciences, describes how she helps students connect what they are learning in the classrom to planning their next steps after college by demonstrating how others can resist the tendency to portray any concern with employability as somehow anti-intellectual, or as a rejection of the ideas and traditions of liberal arts education. students are provided opportunities to practice and demonstrate soft skills and articulate connections between what is taught and how it can benefit non-profits or for-profit organizations hiring graduates. The New Vision for Education project examines the role that technology can potentially play to improve education for the future. In phase II, we investigated innovative ways to help students develop competencies* and character qualities broadly defined as social-emotional skills, which are critical components of 21st-century skill framework but not a core focus in today’s curriculum. Social and Emotional Learning (SEL) will prepare today’s students for this evolving workplace, with consequent benefits for individuals, businesses, the economy and society as outlined in the World Economic Forum Report. Explore the two resources below to obtain employabiity skills topics and learning objective samples that can help generate ideas for complementary content for your courses. Skillsoft – An eLearning resource that provides a wide range of business skills and leadership content including a catalog of courses with learning objectives, white papers, case studies, and analyst research reports. complex life and work environments in the 21st century. The 4C’s include creativity, critical thinking, communication and collaboration and are considered essential to prepare learners for the future. Incorporate industry trends and professional development opportunities within learning activities, so learners can keep abreast of industry changes by having them compare and contrast association information, identify historical changes, or predict future trends. Directory of Associations – Find over 35,000+ local, regional, national and international associations. Search by state, category, type and size. CareerOneStop – Locate national professional associations by occupation or industry served. Contact associations to find professional development opportunities, and keep current on changes in your industry. Search by industry, occupation, or association name. If you want your learners to have opportunities to explore the realistic aspects of the world of work and future jobs, think about ways to incorporate labor market, industry and occupational information into your learning activities. Below are a few resources to get you started. The more you know about the job market, the more you can build career resilience. Research career profiles, career videos, what’s hot, compare occupations, research industries and tools such as the salary finder. Feature articles present an in-depth look at a range of career topics. You’re a what? explores unusual occupations through the work of someone in that occupation. Interview with a… describes, in Q & A format, a specific worker’s career path. 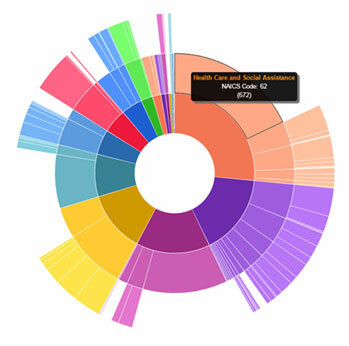 Data on Display is a graphic presentation of data on employment and other topics. Explores the future of jobs and the pace of change to the global employment landscape up until the year 2020, as anticipated by the some of the world’s largest employers. Provides information about employment, skills and workforce strategies for the Fourth Industrial Revolution. Details drivers of change, workforce disruption, expected time of impact on employee skills and job quality, skills forecast change management and future workforce planning barriers and strategies. Emerging job family in focus, country/regional, industry gender gap (pg. 71). Listed below are tools you might consider using to enhance student engagement to facilitate connecting course content with real-world scenarios and trending information. Global Transformation Maps is a dynamic knowledge tool to understand the issues and forces driving transformation change across economies, industries, global issues and the World Economic Forum’s system initiatives. Tip: Select Workforce and Employment (requires creating a free account to access interactive map). Review MindSumo real-world company problems and use as a guide to develop simulated learning activities. Skills Profiler creates a customized list of your skills and matches them to job types that use those skills; identify skills from a current or past job and connect them to new career options for consideration. Do you and your learners know what employers really want? Augment your learning activities with information about which skills, abilities, and expertise employers in various fields are seeking and how to incorporate the most relevant skills and keywords in résumés, cover letters, and interviews. In much of the recent research to prepare learners for the 21st Century Workforce, a common recommendation is for universities to develop meaningful partnerships with employers. Learn about best practices from others. A Toolkit for Building Successful Partnerships – The toolkit includes creating a navigator for industry partners, key characteristics of productive partnerships, practical steps for building relationships between colleges and industries. Creating Industry Relationships that Work – Driven by a lack of skills and knowledge that can impede the nation’s global competitiveness, a collaboration of leaders from industry, city government, the school district, higher education and non-profit youth development organizations formed a coalition to become instrumental in education innovation. The National Network’s library of tools, guides, white papers, frameworks and other resources can provide guidance to educators and other learning providers so they will know what foundational skills to emphasize. These products can also help employers, industry leaders, learning providers and others who seek to take action and connect learning and work in their companies, communities and beyond. Learn more about the National Network’s innovation projects. Work-and-Learn in Action Guidebook – introduces employers, educators and others to a range of options along the work-and-learn continuum to help them find an approach that works for their organization and community. Common Employability Skills – a cross-industry approach to foundational skills regardless of where employees work. Blueprint for Organizations to Create Standards-Based Credentials -a first step in defining the qualities that make programs valuable to consumers—employers, workers and students. Learn how the Necessary Skills Now teams of faculty and employers will develop a curriculum that integrates technical content and employability concepts within existing courses rather than teach stand-alone courses on employability topics in isolation from the technical content. The project will provide opportunities to teach employability skills prioritized by industry within discipline-specific courses using authentic workplace scenarios as the context for instruction. Validate broad employability skills categories; select and prepare curriculum development team members for collaboration. Using an integrated curriculum development process, develop, pilot, revise, and disseminate 12 curriculum projects (six per sector) integrating employability and technical course concepts. Provide faculty professional development resources and workshops to support implementation of integrated projects and replication of curriculum design process across other institutions and sectors. Learn more about project deliverables, outcomes and pilot sites, or apply to become a pilot site by completing the interest form. How are higher education institutions developing coherent employability programs’? Best practice methods of embedding employability skills into the curriculum, and the importance of pedagogy. What graduate employability skills to employers value? How can higher education institutions and employers build closer working relationships? In a McGraw-Hill Education 2015 Workforce Readiness Survey, thirty-five percent of college students said college was effective in preparing them for a job while 61% wanted classes designed to help build career skills. Additionally, in an IBM Institute Report, Pursuit of Relevance: How Higher Education Remains Viable in Today’s Dynamic World, only 43% across industry and academia believe higher education prepares students with necessary workforce skills. If you’re seeking ideas for curriculum improvement, learn how other universities are augmenting their curriculum with real-world, career-specific teachings. Learning to Work Working to Learn – a publication that showcases promising examples of business-higher education partnerships that embed career development throughout a student’s college experience and treat both students and employers as customers. If you’ve been trying to identify employability skills’ rubrics, check out the resources below. choice, flexibility, writing required, inquiry-based learning, real-world connection, collaboration, digital literacy, entrepreneurial skills, and mastery learning. ConnectEd Studios Rubrics Bank – You’ll need to establish a free account to access the rubrics bank. Sample rubrics you might be interested in include teamwork, group skills, and digital communication to name a few. Study.com has over 22,000 video lessons searchable by grade level, subject, and keyword with 50,000+ additional articles relative to making college and career decisions. Preview lesson content by previewing the partial transcript to explore potential employability skills topics complementary to your courses. Tip: Use the keyword search feature to explore content and review disciplines other than yours for complementary content (e.g. Effective Communication in the Workplace; Philosophy – Ethics in America etc.). If you’re wanting to identify resources by industry sector, ConnectEd is your go-to resource providing a wealth of curriculum resources including lesson plans, student handouts, and media and web resources. The Leadership Development Center at York College conducted a national professionalism study, which identified key professionalism components spanning across industries and occupations. 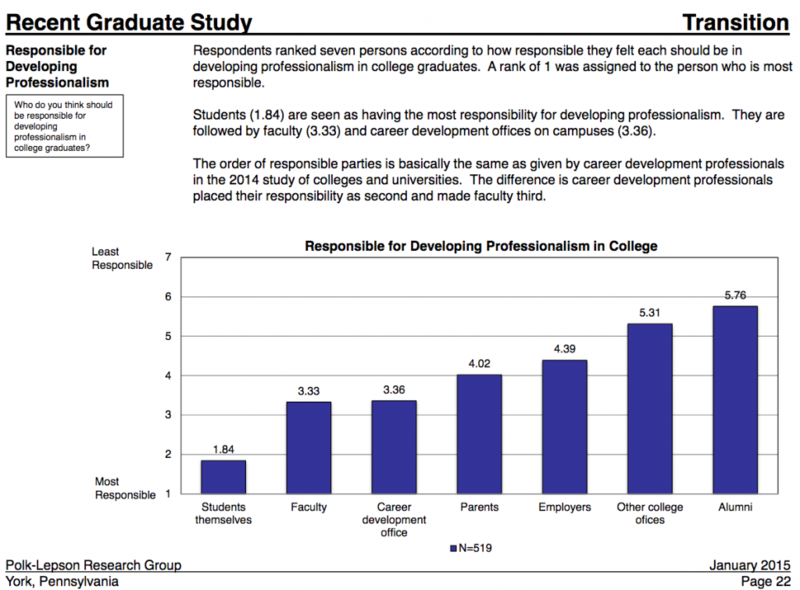 In the 2015 report, respondents ranked seven responsible parties according to how responsible they felt each should be in developing professionalism in college graduates. Students themselves were ranked number one and were followed by faculty ranking number two. The report also describes the qualities of professionalism and unprofessionalism. This list of qualities could be used for developing learner expectations for your course and allow various opportunities for practice in adopting professional attitudes and behaviors prior to graduation. Adapt ideas from this learning activity to help your learners improve in professionalism behavior and attitudes. The report, Greater Expectations: A New Vision for Learning as a Nation Goes to College, details findings and recommendations that promote the kind of learning students need to meet emerging challenges in the workplace, in a diverse democracy, and in an interconnected world. The report also proposes a series of specific actions and collaborations to substantially raise the quality of student learning in college. attempted to align particular kinds of curriculum and pedagogic practices that are associated with specific kinds of learning. The Dialogue Forum for the ALTC National Teaching Fellowship booklet contains information pertaining to the fellowship program, project details and findings. Explore the ACT WorkKeys Assessment information developed to measure foundational hard and soft skills relevant to any occupation, at any level, and across industries. Each assessment has characteristics and skills divided into seven levels of difficulty. Use the information to explore ideas for developing or enhancing learning activities. Graphic Literacy – Use charts, graphs and diagrams for identifying what information is being presented and understanding how to use it. Workplace Documents – Be creative and incorporate readings that reflect real workplace documents. Learners can gather information from the documents to make job-related decisions and solve problems. Sample documents can include messages, emails, letters, directions, signs, bulletins, policies, websites, contracts, and regulations. Business Writing – Assess learning activities in the context of workplace writing needs. Content needs to be clear and free of distractions such as poor grammar, misspellings, and extraneous information. Explain to learners how careless errors may lead the reader (e.g. customer, supervisor etc.) to believe other errors may exist in terms of facts, resulting in the writer (or employee) losing credibility and trustworthiness. Workplace Observation – Provide opportunities for learners to observe, follow, understand, and evaluate processes, demonstrations, and other workplace procedures. Fit – Help learners identify interests and values compatible with a work environment conducive for job success. Talent – Develop activities to increase awareness of a student’s attitude or behavior, that if demonstrated in the workplace, could lead to disciplinary action or termination. Provide opportunities for growth and feedback. Skillsoft Books is a new database resource provided by UIS Brookens Library. Access the complete, unabridged content of more than 20,000+ online books and 40,000+ streaming videos in a fully searchable database. TIP: For relevant information pertaining to employability skills and industry, search the Business Skills and Government Categories. Select current trending workplace articles that can be used to demonstrate real-world application and connects course concepts with skills. Login now to explore Skillsoft Books (requires UIS Netid and password). Relating: Learn in the context of life experience. Experiencing: Learn in the context of exploration, discovery, and invention. Applying: Apply concepts and information in a useful context such as projects related to a possible career, or in an unfamiliar location such as the workplace. Cooperating: Cooperate in the context of sharing, responding and communicating with other learners. Transferring: Learn in the context of existing knowledge, or transferring uses and builds upon what the learner already knows. Are you teaching contextually? Take the Center for Occupational Research and Development’s self-test to find out. Additional supplemental resources for contextual teaching include the toolkit which includes lesson design elements and templates, and a table comparison between a traditional and contextual course environment. The 21st century student outcomes are the skills, knowledge and expertise students should master to succeed in work and life in the 21st century. The P21’s Framework for 21st Century Learning was developed with input from teachers, education experts, and business leaders to define and illustrate the skills and knowledge students need to succeed in work, life and citizenship, as well as the support systems necessary for 21st century learning outcomes. 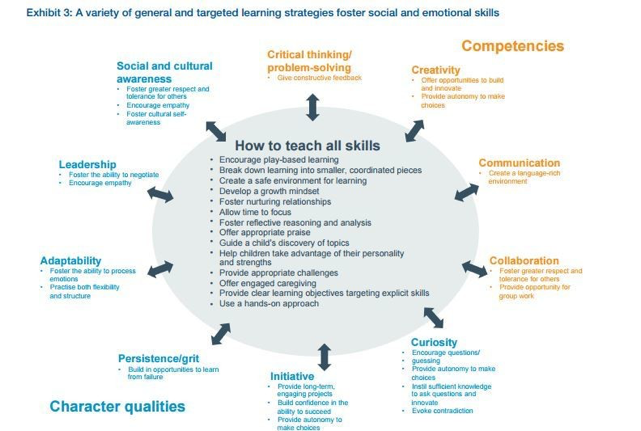 The theme and skill categories below have corresponding Student Outcomes. Determine which outcomes you have already included in your courses, or use as a reference to consider adding to your course. OpenLearn provides educational resources that can be filtered by skills, subjects, and free courses. Resource type includes articles, activities, courses, eBooks, Audios, Videos, TV & Radio and Posters & Booklets. The North Carolina Network for Excellence in Teaching developed an Employability Skills Resource Toolkit comprised of eight modules for faculty to use for integrating employability skills across the curriculum. Use the modules to introduce a topic or adapt for course-specific content. Each module contains instructional materials with course lessons and learning objectives, questions for reflection and discussion, student handouts, assessment rubrics, facilitator notes and annotated presentation slides.